We present a case of endometrioid carcinoma metastasis in the bladder mimicking as the second primary of urinary bladder on 18F-fluorodeoxyglucose positron-emission tomography/computed tomography (18F-FDG PET/CT). The presentations of bladder lesions on 18F-FDG PET/CT are varied, and rare presentations of common malignancies can pose a significant diagnostic challenge as in the index case and highlight the importance of histopathological examination to confirm any unusual FDG uptake confounding the diagnosis. A 69-year-old female presented with a 3-month history of painless vaginal bleeding. Initial pelvic ultrasonography revealed hypoechoic lesions (likely fibroids) in the anterior and posterior walls of the body of the uterus and additional lobulated hypoechoic lesions in the left lateral wall of the urinary bladder. 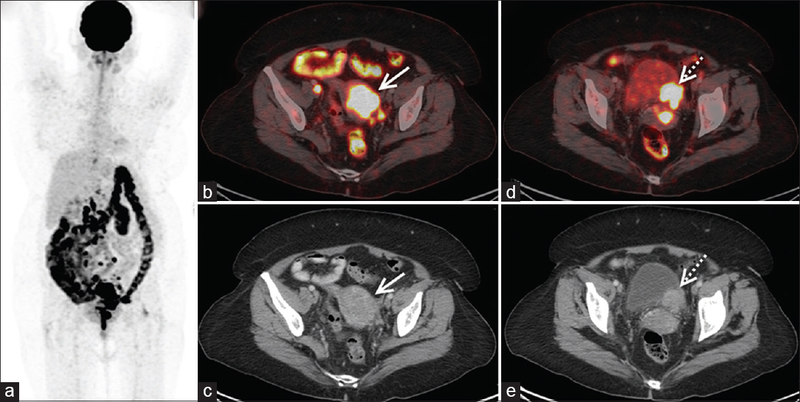 A whole-body 18 F-fluorodeoxyglucose positron-emission tomography/computed tomography (18 F-FDG PET/CT) done for characterization and staging revealed intense tracer uptake in the heterogeneously enhancing soft-tissue lesion in the body and fundus of the uterus [Figure 1]a, [Figure 1]b, [Figure 1]c. In addition, there were intensely FDG-avid heterogeneously enhancing soft-tissue lesions in the left posterolateral and posterior wall of the urinary bladder with one of them showing loss of fat planes with the uterine cervix giving the impression of second primary malignancy of urinary bladder with cervical infiltration [Figure 1]d and [Figure 1]e. Intense tracer uptake was also noted in few enlarged peripancreatic, mesenteric, precaval, aortocaval, retrocaval, and bilateral external iliac lymph nodes. With a provisional diagnosis of second malignancy in the urinary bladder, the patient underwent transurethral resection of bladder tumor (TURBT). However, histopathology revealed the presence of metastatic endometrioid adenocarcinoma [Figure 2]a and [Figure 2]b.
Endometrial carcinoma is a common malignancy of female genital tract with an increasing incidence in the postmenopausal women., Local recurrence and distant metastases from advanced endometrial carcinoma, even after surgical resection, are known to occur in the pelvis, pelvic and paraaortic lymph nodes, peritoneum, and lungs. Supradiaphragmatic lymph nodes, liver, adrenals, brain, and soft tissues are the uncommon sites for metastases. In advanced cases, it may rarely involve the bladder and bowel mucosa also. Urinary bladder involvement in endometroid carcinoma is a rare entity resulting from direct extension, metastasis, or malignant transformation of endometriosis., This case showcased a diagnostic conundrum of an endometrial neoplasm metastatic to the bladder giving an initial impression of a second primary urothelial malignancy on imaging.18 F-FDG PET/CT is a very sensitive oncological imaging modality with ever-increasing role in genitourinary malignancies. The unusual presentations have been recognized with improved imaging. Few of imaging limitations and pitfalls are encountered, and some of them had been addressed.,, However, in the index case, subsequent TURBT and histopathological examination revealed the features of nonurological endometroid adenocarcinoma. Thus, this case emphasizes the diagnostic challenges posed by rare presentations of certain malignancies on 18 F-FDG PET/CT and the importance of histopathological examination to ascertain the accurate diagnosis and management in such cases. Morice P, Leary A, Creutzberg C, Abu-Rustum N, Darai E. Endometrial cancer. Lancet 2016;387:1094-108. Saso S, Chatterjee J, Georgiou E, Ditri AM, Smith JR, Ghaem-Maghami S, et al. Endometrial cancer. BMJ 2011;343:d3954. Kurra V, Krajewski KM, Jagannathan J, Giardino A, Berlin S, Ramaiya N, et al. 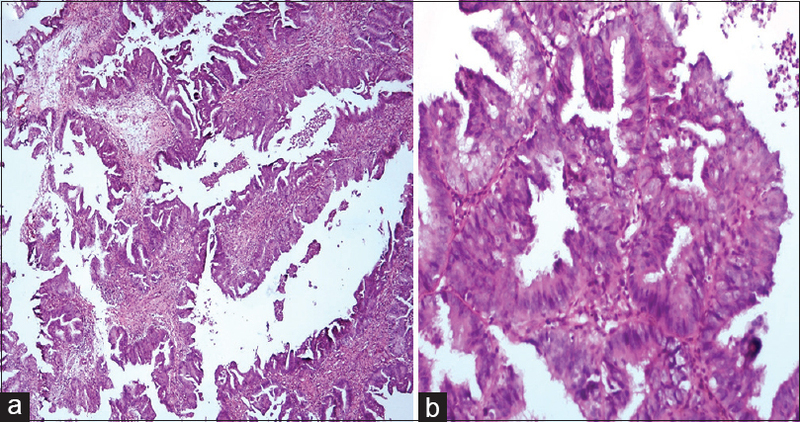 Typical and atypical metastatic sites of recurrent endometrial carcinoma. Cancer Imaging 2013;13:113-22. Tarumi Y, Mori T, Kusuki I, Ito F, Kitawaki J. Endometrioid adenocarcinoma arising from deep infiltrating endometriosis involving the bladder: A case report and review of the literature. Gynecol Oncol Rep 2015;13:68-70. Sharma A, Mete UK, Sood A, Kakkar N, Gorla AK, Mittal BR, et al. Utility of early dynamic and delayed post-diuretic 18F-FDG PET/CT SUVmax in predicting tumour grade and T-stage of urinary bladder carcinoma: Results from a prospective single centre study. Br J Radiol 2017;90:20160787. Beyer T, Townsend DW, Blodgett TM. Dual-modality PET/CT tomography for clinical oncology. Q J Nucl Med 2002;46:24-34. Lakhani A, Khan SR, Bharwani N, Stewart V, Rockall AG, Khan S, et al. FDG PET/CT pitfalls in gynecologic and genitourinary oncologic imaging. Radiographics 2017;37:577-94.